Five-star resort Finolhu has found a way to merge the luxurious Maldives experience with glamping – where glamour meets camping. 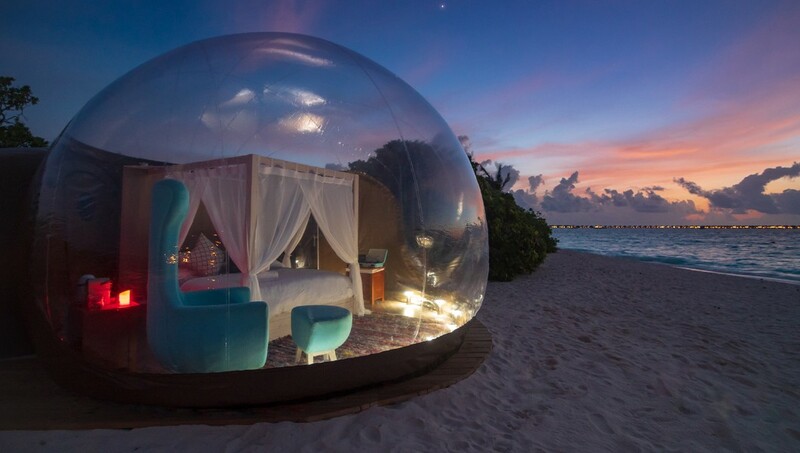 Self-described as a retro-chic “groovy getaway”, the Maldivian resort has unveiled the new Beach Bubble tent, which is the first of its kind in the archipelago. Designed by Eye In The Sky, the transparent inflatable bubble is a unique, inspiring environment where guests can enjoy an incredible, closer-to-nature experience, without compromising on high-spec design and luxurious creature comforts. Located on Finolhu’s famous 1.5km sandpit, far from the buzz of the island’s iconic 1 OAK Beach Club, the Beach Bubble is available exclusively for incredibly romantic, one-night-only ‘Dream Eclipse’ experiences under the stars. The pioneering Bubble Tent provides a UV-protected, fully waterproof, climate-controlled cocoon that offers guests a uniquely immersive nature experience, with Precontraint Serge Ferrari technology, custom-fitted wooden floors and bespoke furnishings, and a separate adjoining bubble bathroom with WC and shower.